Cate lives in Hooper Bay, Alaska, which has afforded her many adventures that Southerners like me will likely never have (like carving up seal carcasses for dinner). One such adventure involved an arctic devilfish. These fish are so spiny, that, as Cate puts it, even accidentally catching one can wound you for life (devilfish = aptly named). This particular specimen had been in the tidal mud for a while, yet still it lived, and its yellow eyes tracked Cate as she walked past it. An experience like that could wound a softy like me for life. But Cate's tougher than that. I highly recommend visiting her blog: but only if you've got the stomach for life in Hooper Bay and among the Yup'ik. dang. that looks weird as hell. Is that the right name? I tried to google it to find more, and didn't come up with anything. Lol DangGina. You beat me to it. I would most definitely crap myself if I saw something like that looking up at me out of the water. I asked a science friend and she said it looks like it belongs to the order scorpaeniformes. That's a start on identifying it. 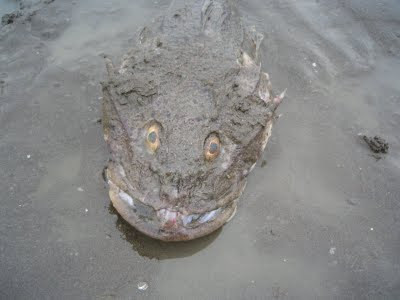 OK, so I'm going to attempt to spell the Yup'ik name:"Kiuqlluaq" which phonetically would be pronounced: "guy-U-thlu-auk"
Well, Devil fish (local term) is supposedly Cottus cognatus or slimy sculpin (AKA kayurrlugaq) according to google. That picture does not appear to be of a slimy sculpin.